Why do developed communities need to evolve? Where is growth encouraged? How is growth and redevelopment managed? Established communities need to evolve to make room for our growing population and to ensure they remain vibrant and continue to thrive. This requires thinking about how to make communities sustainable, affordable and dynamic, so that they continue to meet the needs of Calgarians in the future. Calgary is growing and demographics are changing. Since 1985 our population and land area have roughly doubled. Our population is expected to double again, to an estimated 2.4 million Calgarians, over the next 60 years. Calgary will be home to an increasingly diverse population including an aging population and more people from other countries. People will be looking for a wider variety of choices in where and how they live their daily lives. It is likely that they will want to change their housing type more than once. Even today, feedback from citizens indicates that many people may want to live, work and grow old in communities that offer a wider range of services and amenities. Citizens also expect travel between home, work and other services to be convenient. The City will need to provide these choices. On average, Calgary will have more elderly people as a portion of the population. In 60 years, there will be 10 times more people that are over 85 years old. Calgary will still have young families, but they’ll make up a smaller part of the population than they do today. People throughout North America are also having fewer children than in the past. This means that much of the city’s growth will be a result of new Calgarians arriving from other countries. There is also a significant growth of one-person households. The anticipated growth in population and changes in demographics brings a need for more housing in different locations and forms throughout the city as well as ways to travel around the city. We need to think about how to make communities sustainable, affordable and dynamic, so that they continue to meet the needs of Calgarians in the future. Growth costs money. Much of the cost from growth goes to infrastructure like roads, transit, water pipes and sewers, fire stations and associated staffing costs. Evidence shows that the larger the land area covered by a city, the more these costs rise. We need to build more housing in developed areas. As we grow, we need to consider our urban footprint and use land wisely. This includes taking into account the housing preferences and needs of our growing and changing population as well as the infrastructure costs to support population increase in developed communities versus developing communities. Ultimately, this means balancing growth between developed and developing communities. Find out more about where growth and density are encouraged and how growth and redevelopment are managed on the next tabs. The Municipal Development Plan encourages future housing and job growth in specific areas of the city. These areas include Activity Centres and Main Streets with retail and business districts that support higher density, more diverse forms of housing, public and essential services, and amenities for everyone. These areas all have frequent and high-quality light rail or bus transit service. Growth must also occur outside of these areas, within all of our communities. This allows for a range of housing types to suit all ages, lifestyles and housing needs in a way that allows the community’s character to evolve. Calgarians’ housing preferences are expected to change due to costs and market demand. By 2039, housing in Calgary will look different than it does today. Within developed areas, more concentrated growth is encouraged along Main Streets, within Activity Centres, and near Transit hubs. Main Streets are active areas that attract Calgarians to socialize, work, shop, dine, and celebrate local events. They are also often important transportation routes. 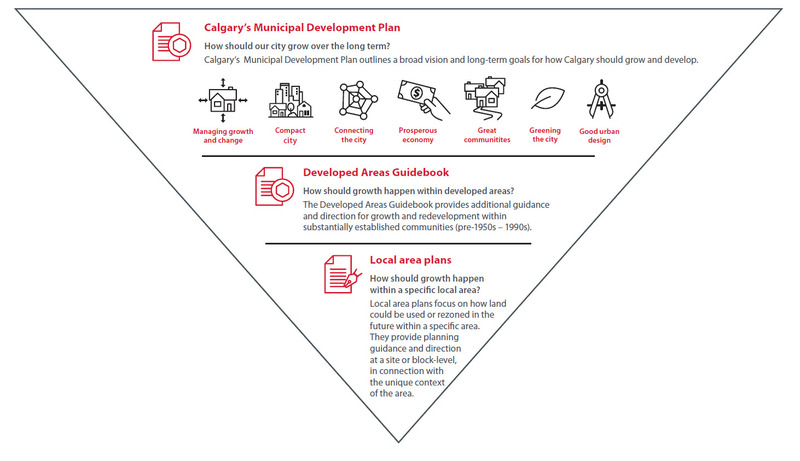 The Municipal Development Plan identifies 24 main streets across Calgary. Main Streets are important to the long-term growth and vibrancy of our city, and are ideal places for mixed-use development, including residential, commercial and retail development. Access to transportation options, infrastructure and amenities make these areas great places to live, work and play. Activity Centres provide surrounding residents with access to local amenities, services and employment opportunities. They are integrated with major transit networks and adjacent communities and often accommodate higher-intensity development. The idea of transit oriented development (TOD) is to encourage development within a 600 metre radius of major transit stations and hubs. By concentrating housing, jobs, and amenities around transit hubs, we can create focal points for diverse, walkable, and complete communities, linked by extensive, high-frequency transit service. By bringing homes, jobs, and amenities closer together, we make walking, cycling and transit in these areas more convenient and appealing. In the next 60 years, most travel in Calgary will be on foot, bike, or transit, and trip distances will be shorter. Moderate growth is encouraged throughout neighbourhoods and residential areas. Redevelopment in these areas is a gradual process. Within these all of these areas, it is property and landowners who decide if and when they might renew or redevelop. Learn more about how growth and redevelopment are managed on the next tab. How do we guide growth & redevelopment in developed neighbourhoods? 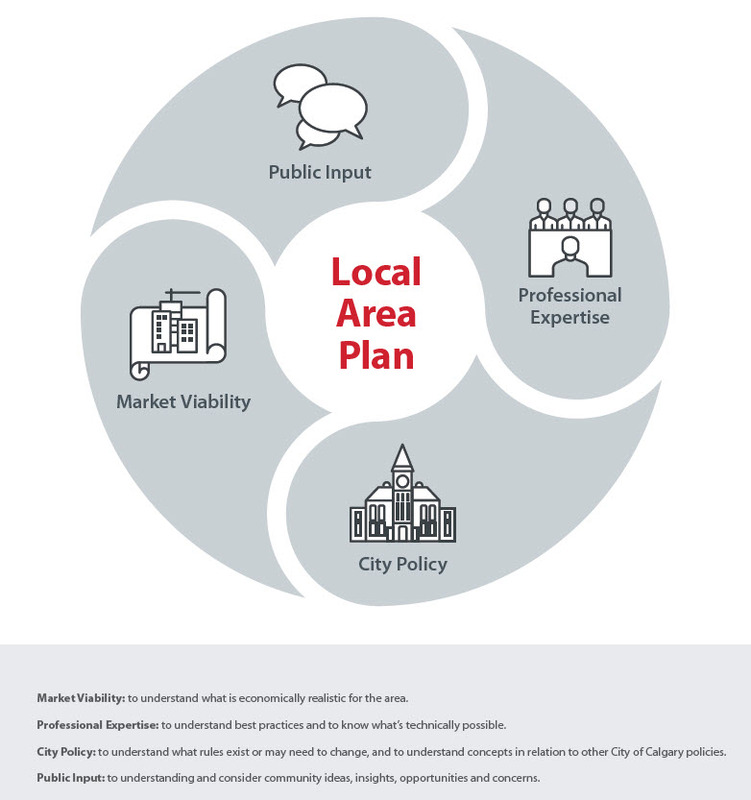 As Calgary grows, we’re working to evolve and build our city in a way that is mindful of the future, promotes sustainable ways of living, encourages varied housing options, is respectful of community character, and balances the interests of neighbourhoods with the interests of Calgary as a whole. City planners, citizens, industry and City Council work collaboratively to create visionary plans to help proactively manage growth and development. These plans provide a common vision and policies for how growth and redevelopment should happen and help guide new redevelopment as it occurs. What is considered as local area plans are created? How do we implement a vision? Key tools, reviews and approvals required to implement and build out the planning vision. A land use redesignation is when the land use district (zone) assigned to a parcel of land is changed to a different land use district (zone). To change the land use district (zone), the landowner must apply for a land use redesignation. Land Use Redesignation Applications are often pursued by landowners who are hoping to build something that is not currently allowed on the site. Often, a change to the land use district (zone) is proposed to enable increased height and density of a building (compared to the current rules on the site) and/or to change the uses, or activities, that would be allowed to occur on the site as part of future developments. 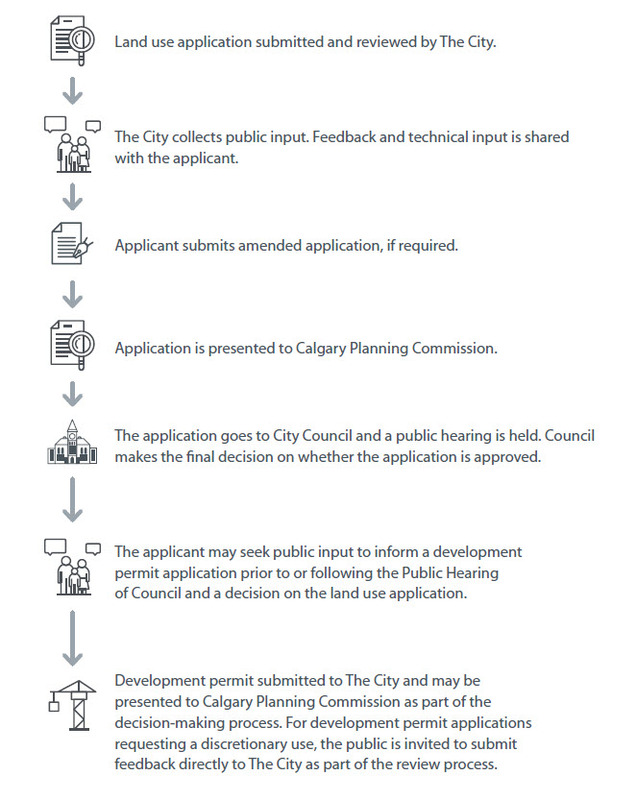 Applications to rezone or redevelop that align with the vision of applicable local area plans, the Municipal Development Plan and other city policies are more likely to be approved. “Our long-term plan at The City is that 50 per cent of growth should be accommodated in new neighbourhoods and 50 per cent in existing neighbourhoods. Learn more about who Calgarians are and where growth is happening in our city. Visit the Calgary Census 2018 page. 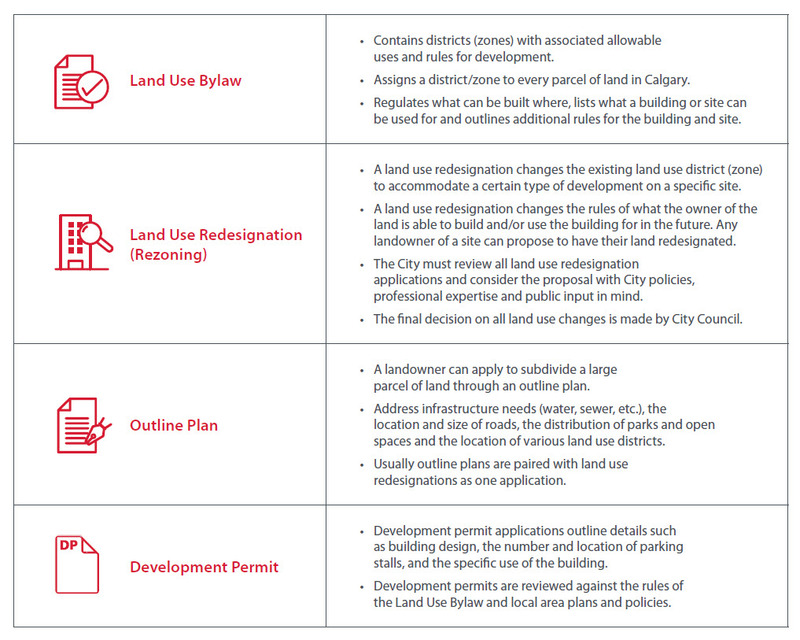 Calgary's Municipal Development Plan is our vision for how Calgary grows and develops over the next 30 to 60 years. City Administration reports on the progress made towards The City’s 60-year goals every four years. See how we're doing, check out the 2018 Monitoring Progress Report page and report. We want to ensure a productive, positive and respectful space for everyone. All questions are welcome, but keep in mind that submissions are being moderated and any comments that are contradictory to the above guidelines will not be published. Be mindful of sharing personal information or other details that you do not want shared publicly, as questions submitted will be viewable to everyone visiting the site. To ask a question you must sign in or sign up. Provide a short summary of your question. Provide detailed information relating to your question. Select a respondent from the list that you would most like to answer your question. These are the people that are listening and responding to your questions. The North Hill Communities Local Growth Plan project team includes a number of City Planners from the Community Planning and Urban Strategy Departments who are dedicated to this project and are ready to answer your questions. Provide the answer to the question. Question can be saved as draft and published when complete.